Does your skin need a pep talk? Every skin benefits from a peptide boost. Because peptides support naturally occurring peptides in your skin like collagen, elastin and keratin. The Peptide Booster contains a powerful blend of eight highly targeted peptides, each one addresses a specific anti-ageing concern, from loss of radiance and uneven skin tone to fine lines and wrinkles. These specialised, cell-communicating ingredients effectively ‘teach’ skin to look and act younger by strengthening its natural reparative abilities. Together with skin-restoring ingredients such as amino acids, antioxidants and hydrators, the Peptide Booster strengthens and protects the skin’s barrier and increases natural resilience. Ideal for all skin types, especially sensitive skin that may not be able to tolerate high strength retinol. Found naturally within the skin, peptides are short chains of amino acids that act as building blocks of proteins such as collagen, elastin and keratin, which are responsible for the skin’s texture and strength. When applied topically to the skin, peptides trigger skin cells to perform specific functions such as building collagen and elastin, encouraging layers of skin to act younger for more supple, rejuvenated-looking skin. How can peptides help my skin? Peptides are cell-communicating ingredients. You can think of them as ‘personal trainers’ for your skin. Peptides tell your skin what to do and how in order to stay firm and younger looking. Peptides also improve skin’s ability to repair itself. Peptides are like keys that only fit into certain receptors (locks) to activate (unlock) specific processes. Not all peptides are the same and all peptides have different benefits for skin. Each peptide precisely targets concerns of loss of firmness, dullness, wrinkles and discolourations. Palmitoyl Tripeptide-1 + Palmitoyl Tetrapeptide-7 + Palmitoyl Hexapeptide-12: These three peptides improve the moisture balance in skin, promote healthier-looking skin, and smooth the appearance of wrinkles. Myristoyl Hexapeptide-16 + Myristoyl Pentapeptide-17: This duo calms signs of redness and helps skin to look and feel more resilient. Hexanoyl Dipeptide-3 Norleucine Acetate: Helps skin’s surface shed properly and speeds up this process for fresher, more vibrant skin. Azelaoyl Bis-Dipeptide-10: Fades discolourations as a result of sun exposure, brightens dullness, and interrupts the formation of damaging substances in skin that lead to loss of firmness. Apply once or twice daily to face, eye area and neck after cleansing, toning and exfoliating. Dispense 2-3 drops and add to your favourite serum or night moisturiser or use alone. If applied alone, follow with the rest of your routine. For daytime use, always follow with a broad-spectrum sunscreen rated SPF 30 or greater. I love all the boosters but especially this one and the niacinamide, I can't be without. Easy to incorporate into your routine and highly effective. I have been using the Peptide Booster for 3 weeks, every morning before my serum and i'm really impressed! I have sensitive-reactive combination skin, with occassional redness and breakouts. This Booster didn't irritate my skin at all and i think my breakouts have become less since i started using it. It's perfect for sensitive skin, it calms my redness and gives an instant glow immediately after using it! Perfect also for my little fine lines especially around mouth. Definately recommended! Aqua, Glycerin (skin-replenishing), PEG-8 Dimethicone (texture enhancer), Tripeptide-1 (skin-restoring), Palmitoyl Tripeptide-1 (skin-restoring), Palmitoyl Tetrapeptide-7 (skin-restoring), Palmitoyl Hexapeptide-12 (skin-restoring), Myristoyl Hexapeptide-16 (skin-restoring), Myristoyl Pentapeptide-17 (skin-restoring), Hexanoyl Dipeptide-3 Norleucine Acetate (skin-restoring), Azelaoyl Bis-Dipeptide-10 (skin-restoring), Glycoproteins (hydration), Phospholipids (skin-replenishing), enisonedA (skin-restoring), Dipotassium Glycyrrhizate (skin-soothing), Arginine (amino acid/hydration), Valine (amino acid/hydration), Glycine (amino acid/hydration), Alanine (amino acid/hydration), Glutamic Acid (amino acid/hydration), Serine (amino acid/hydration), Threonine (amino acid/hydration), Yeast (Faex) Extract (skin-soothing/hydration), Isoleucine (amino acid/hydration), Proline (amino acid/hydration), Histidine (amino acid/hydration), Phenylalanine (amino acid/hydration), PCA (skin-replenishing), Phytic Acid (antioxidant), Panax Ginseng Root Extract (plant extract/antioxidant), Sodium PCA (skin-replenishing), Psidium Guajava Fruit Extract (guava fruit/antioxidant), Euterpe Oleracea Fruit Extract (acai/antioxidant), Ahnfeltiopsis Concinna Extract (algae/hydration/texture enhancer), Dextran (natural sugar/hydration), Hydrolyzed Silk (texture enhancer), Lecithin (skin-restoring fatty acid), Glyceryl Polymethacrylate (film-forming agent), C12-16 Pareth-9 (emulsifier), Trideceth-12 (emulsifier), Sodium Lactate (hydration), Carbomer (texture enhancer), Aspartic Acid (amino acid/hydration), Polysorbate 20 (emulsifier), Butylene Glycol (texture enhancer), Caprylyl Glycol (texture enhancer), PEG-8 (texture enhancer), C11-15 Pareth-7 (emulsifier), Guar Hydroxypropyltrimonium Chloride (texture enhancer), Phytosteryl/Octyldodecyl Lauroyl Glutamate (hydration), Ectoin (hydration), Citrate Buffer (pH adjuster), Trimethylsiloxyamodimethicone (texture enhancer), Phenoxyethanol (preservative), Sodium Hydroxide (pH adjuster), Ethylhexylglycerin (hydration). Can I use the Peptide Booster if I have sensitive or rosacea prone skin? It is not a problem to use the Peptide Booster if you have sensitive or rosacea-prone skin. In fact, for those who cannot tolerate our higher-strength retinol products, the Peptide Booster is a great option to consider. 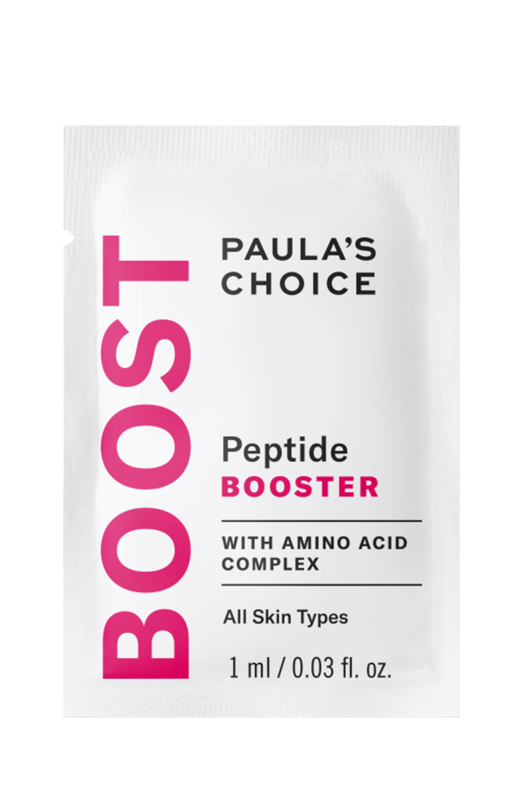 Can I mix the Peptide Booster with other products for application? The peptide booster can be used alone or mixed with a serum, night time moisturiser or another booster product. What step of my routine should I use the Peptide Booster? You can use the booster alone after exfoliating or add it to your favourite night time moisturiser or serum.